A founding member of the legendary Cuban fusion jazz band Irakere in the '70s, Arturo Sandoval has inherited the title of greatest trumpet player in jazz  a title once held by his mentor, Dizzy Gillespie, and then by Maynard Ferguson. Which isn't the same as best jazz trumpeter  Wynton Marsalis would have to figure into that equation, or Tom Harrell or Terence Blanchard, depending on your particular taste. But as with both Gillespie and Ferguson (or Doc Severinson and Al Hirt, for that matter), Sandoval is known for the pure athleticism of his playing, for his ability to find his way to the very highest registers of his instrument without losing any of his gorgeous tone or musicality. What sets him apart from all of them except Gillespie is his melding of his native Latin traditions with American jazz. And in Sandoval's case, the integration is far more complete than in Gillespie's case, as Sandoval grew up in Cuba listening to American jazz. His new album, "Rumba Palace," is a sometimes over-the-top but always entertaining combination of Ferguson's brassy swagger and his own roots in Irakere. 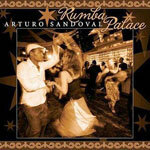 Sandoval wrote nine of the 10 tracks here; three of them are fairly pure Latin pieces (including "A Gozar" and "El Huracan del Caribe," which both feature Sandoval on vocals), with the rest being far more immersed in jazz than Latin strains. But Sandoval is in the prime of his career right now at age 57; his playing on this album is bright, confident, strong and lyrical, the songs melodic and memorable.